Little Mix's startling rise to win the eighth series of UK TV show The X Factor in 2011 broke the mould of talent show winners. 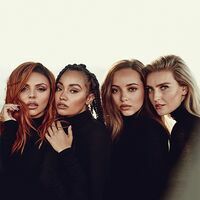 The girl band were not only the first group to win the show, they were unique in that none of the members - Perrie Edwards, Jesy Nelson, Leigh-Anne Pinnock and Jade Thirlwall - knew one another before the competition started. All originally entered as solo acts and made it through to boot camp, but failed at the first stage. Instead of discarding them completely, however, the judges ripped up the rule book to give them the chance to work in different ensembles with other contestants. Initially Perrie and Jesy formed a unit called Faux Pas, while Leigh-Anne and Jade were a part of a trio called Orion. Both again failed to make the cut but were given a further chance to progress and ended up together as a four-piece, originally called Rhythmix, switching to Little Mix due to a name clash with a children's music charity. From that point they didn't look back, their bubbly personalities and close harmonies proving a big hit with fans and they went on to beat Marcus Collins in the final. Their debut single, a cover of Damien Rice's Cannonball, topped the UK chart in December, 2011 and they also sang on another UK Number 1, Wishing On A Star, with other The X Factor finalists. In 2012, Little Mix were working on their first album, with Gary Barlow among the songwriters collaborating with them. Writer: Camille Purcell - Linus Nordström - Frank Nobel - Victor Bolander - Tyrone Griffin, Jr. / Composers: Camille Purcell - Linus Nordström - Frank Nobel - Victor Bolander - Tyrone Griffin, Jr.